I have been critical of Cullen Bunn's Aquaman and Lobo, even the pace of his Sinestro, but there's no question that Bunn writes Sinestro himself well. A lot of things come together in Sinestro Vol. 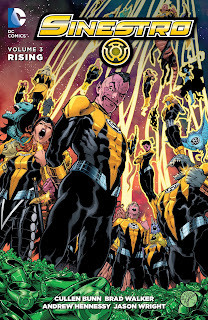 3: Rising, a book that in some ways doesn't move this series' plot that much farther forward, but whose depiction of Sinestro and those around him is so good, it increasingly ceases to matter. Further, Bunn's Lobo series also gets a significant pick-me-up being now essentially just a second Sinestro title. In the DC You absence of a proper Green Lantern title, Bunn can now apparently do what he wants with the franchise and its catalog of characters; the result is madcap and bloody, probably a bit wrong-headed but a bunch of fun in its audaciousness. Rising picks up, as Sinestro Vol. 2: Sacrifice ended, with the imminent of the destruction of Sinestro's New Korugar. This comes and goes over the next few issues -- with agonizing slowness, actually -- as Sinestro trades mostly verbal barbs with daughter and former Green Lantern Soranik Natu, New God Bekka, and his dark prophet Lyssa Drak. Sinestro is a character so complex and charismatic that he can be riveting if written well (as Geoff Johns did) and Bunn succeeds immeasurably. The scenes of these three women both with Sinestro and without -- all of whom love and hate him for different reasons -- all sing, with fine art by Brad Walker. Some of these proceedings we've already seen from a future perspective, allowing the reader to focus more on character than plot. The revelation of the traitor through to the end all works very well. Bunn's Sinestro's latest machinations correspond with the disappearance of the Green Lantern Corps over in those titles, which is a boon for Bunn. Still Bunn does not do much to show the Sinestro Corps active and working, but the way he lines up with current events is interesting, as is the dilemma Sinestro faces as to whether to patrol the stars or care for his native Korugans. But in the absence of the Lanterns, and even with Sinestro somewhat earthbound, Bunn uses Lobo and the Lobo title well as a counterpoint, shunting Lobo off among the stars hunting the rival Lantern colors. This includes Lobo at times up against the Indigo, Red, and Blue Lanterns, all in ridiculously bloody battles. A clear problem with Bunn's Lobo so far is that Lobo has fought no-name aliens with no clear consequence, so pitting him against these well-established Lanterns is a definite improvement. Startlingly, Lobo kills just about all the Indigo Lanterns, and then goes so far as to kill Red Lanterns Rankorr, Dex-Star, and Atrocitus, which seems absurdly more than Bunn should be allowed to do. (Unfortunately Bunn seems confused about the character growth of Bleez and others in Charles Soule's Red Lanterns, including turning away from Atrocitus, but that seems a problem continuing to Rebirth that's not just limited to Bunn.) There's a very effective scene where Lobo delivers Blue Lantern Saint Walker to Sinestro, before Sinestro tries to win Walker's assistance with both carrot and stick with chilling efficiency. Initial artist Brad Walker rules the book, especially with his detailed facial expressions that demonstrate the characters' constant ambivalence. One can't argue with Ethan Van Sciver closing the book, the artist who ushered Sinestro back into prominence originally and who still draws Sinestro at his most alien-looking. Robson Rocha does fine in the middle, though I think this zipped-down costume he has Soranik in shows a thorough misunderstanding of that character. Cullen Bunn has the Sinestro title set up for a fine conclusion, with the Red Lanterns hunting Lobo, I believe, and Sinestro hopefully finally enacting the war he's been going on about throughout this volume. One wants these books to trend up, and with Sinestro Vol. 3: Rising, it does just that; though there's not a strong sense of the DC You in this volume, the fact that Sinestro does improve in this era is another feather in DC You's cap. I head into the fourth volume much more enthusiastic for this title than I have been so far.